ZenRobotics wants to use big scary robots to save the world, one aluminum can at a time. Robots are coming to take over the world…of recycling. Finland based ZenRobotics is a company on a mission: use artificial intelligence and the latest sensor technology to transform industrial robots into lean mean going-green recycling machines. Their product, the aptly named ZenRobotics Recycler, is a prototype platform that sorts through waste on a conveyor belt, picking out those materials that can be recycled for profit. Metals, woods, plastics, glass – the combination of sensors and artificial intelligence lets ZenRobotics Recycler find them all. Along with their vision for a robotically-enabled recycled future, ZenRobotics also has one wicked sense of humor. Check out the ‘trailer’ for their prototype system in the video below. YOU. ARE. NOT. READY. FOR. A. RECYCLING. ROBOT. THIS. AMAZING. 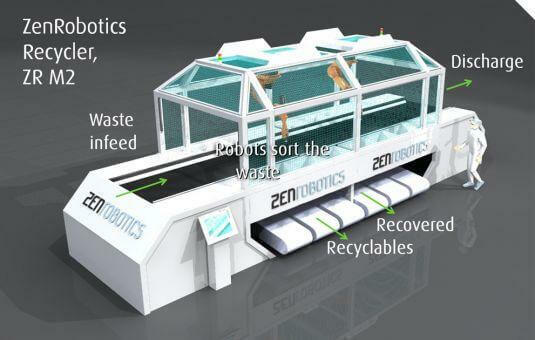 We’ve seen recycling robots before, and honestly the ZenRobotics Recycler isn’t that creative of an idea. Robots picking up trash by hand – I think a kindergarten class could have dreamed that one up. What is really innovative is the way that ZenRobotics has approached the concept. Instead of working tirelessly on creating the robot, they’ve focused on the intelligence behind it. The ZenRobotics Brain is modeled on the human cerebellum and seeks to teach the robotic arm how to work smarter not harder. Take your average industrial robot arm and give it a bunch of new senses: near infrared cameras, visible light cameras, 3D laser scanning, haptics, x-rays, metal detectors, weight scales, etc. Then, feed all those inputs into a piece of smart software (ZenRobotics calls this ‘sensor fusion’) and have the robot learn which data corresponds to which material. Give it feedback when it succeeds, and humiliate it when it fails (no, not really). 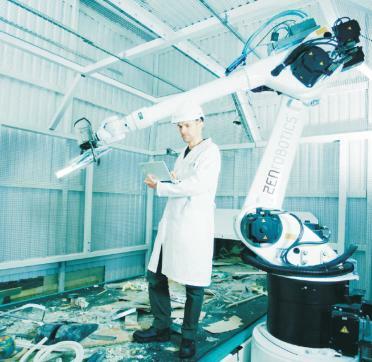 As the ZenRobotics Recycler learns, it can pick out the right materials with high accuracy. Eventually the ZenRobotics Recycler will feature multiple arms working on sorting at high speeds. For now ZenRobotics has a single Recycler, a 6 ton robot arm that is thirty three feet long and capable of high speed motion over a long range. It’s currently being tested with SITA Finland (one of Scandinavia’s biggest recycling conglomerates) for post demolition/construction waste. In the future ZenRobotics plans on having several different configurations and sizes for their systems. I’m sure commercial and municipal recycling are on their road map, though it doesn’t seem like we’ll ever see something on the scale for use in your home. Every time you visit ZenRobotics you get a different slogan. Another example of how the company is using humor to get their brand noticed. To match the intelligence of the ZenRobotics Brain, you have the ZenRobotics marketing strategy, which is about the coolest I’ve seen. Movie trailers for robots are just the beginning. They also have a page for ‘entertaining news‘ about the company – where ‘entertaining’ is a euphemism for ‘seen through a greatly distorted and comedic point of view’. Their website also features a slogan generator so that every time you visit you get a new message under their logo (most are of the ‘kill all humans’ variety). Add in some funny pictures, some over the top mission statements and you’ve got a company whose corporate material is actually fun to read. No wonder they’ve been reviewed by several EU media teams as well as the New York Times. With some decent private funding (more than E700k as of this fall) and their partnership with SITA Finland, I think we can expect ZenRobotics’ AI-based approach to recycling to continue to make some good headway in the years ahead. Who knows, if they prove really successful maybe we’ll get robots to solve the rest of our eco-worries as well. I bet there’s a movie in that, too.